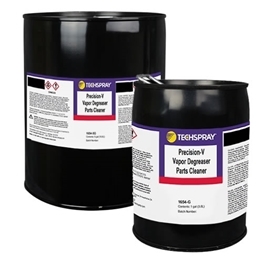 Techspray has engineered solvent cleaners that offer exciting new options for precision cleaning. Precision-V cleaners are powerful, leave no residue, evaporate extremely fast, and are nonflammable with no flash-point. Electronics, optics, and metal parts are quickly and thoroughly cleaned, eliminating the need for further rinsing. Precision-V is non-ozone depleting, so ideal replacements for cleaners containing Freon, HFC-141b and AK225. Flux Removers clean R, RA, RMA and No-Clean type flux residues after high temperature reflow, wave and hand-soldering, ideal for lead and lead-free processes. 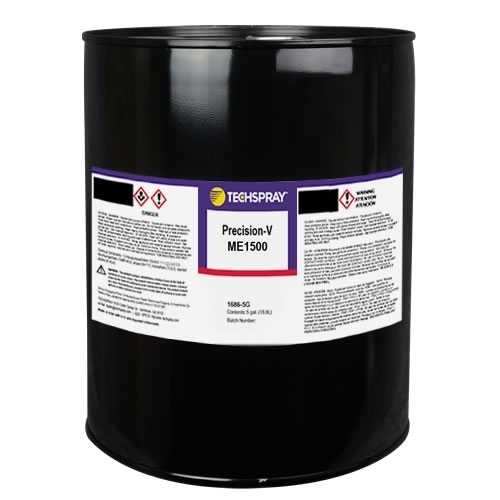 Precision-V ME-1500 has azeotrope-like properties that allow it to maintain stable properties as it is cycled in a vapor degreaser. It is neither reactive nor corrosive to metals commonly found in the construction of vapor degreasers. Exposure to Precision-V solvents is less hazardous than many other solvents commonly used in vapor degreasers: e.g. TCE (Trichloroethylene, CAS #79-01-6), nPB (n-Propyl Bromide, CAS #106-94-5), and Perc (Perchloroethylene. CAS #127-18-4).